This is a really big game for both teams and while this means the pressure will be on these sides, it can only be hoped that these teams will come out firing in the hope of grabbing a win. The home side have won back to back games recently and they currently have a 14-11 record. This is looking good for a playoff spot but it is a far way away from being clinched, which means that every game is absolutely essential for the Spanish side. The Russians have won four games in a row, refining their form at a crucial time, and their 19-6 record leaves them lying in a very good place. 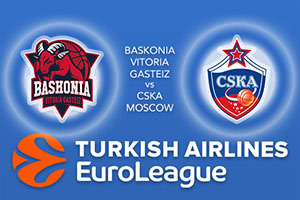 With Real Madrid losing on Thursday night, CSKA Moscow have the chance to put some daylight between themselves and the Spanish giants and the Russians will also be looking to secure their home court advantage in the Euroleague playoffs. The fact that both of these teams have so much to play for should ensure that we have a cracking game on Friday night to round out the Euroleague week again. When these teams met earlier on in the season, there were points galore as the Moscow side triumphed by a score of 112-84. There was 34 points and 10 assists for Milos Teodosic and there was another double-double for James Augustine. Shane Larkin has had an excellent season so far, offering an average of 13 points per game for the hosts but Nando De COlo is still a player worth watching, with an average of 20.1 points per game. Teodosic has chipped in with an average of 15.6 points per game while Rodrigue Beaubois has offered an average of 12.7 points per game. You can take the away side in this game and backing CSKA Moscow at -3.5, at odds of 1.90 is likely to be a sound bet. If you are looking at the Over/Under market, you should go OVER 168.5, which you can find at odds of 1.90 for this game. Bet Now!